According to the Washington Post, a Virginia woman found a Renoir, Landscape on the Banks of the Seine, in a box of knickknacks she bought in a West Virginia flea market for $7. The best part? 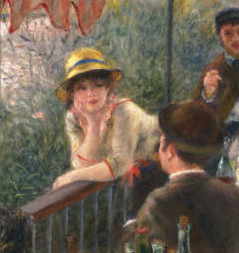 The painting was once owned by Alphonsine Fournaise–she who flirtatiously leans against the railing in our Luncheon of the Boating Party. The lucky bargain hunter is having the painting auctioned off, and plans to use the money for house repairs and to take her mother on a trip to France.